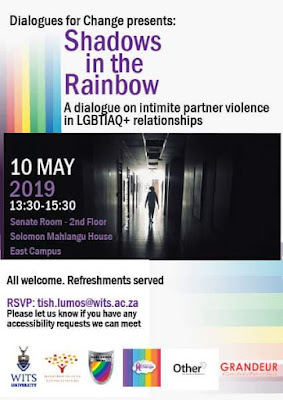 JOHANNESBURG: Dialogues for Change presents Shadows in the Rainbow: a dialogue on intimate partner violence in LGBTIAQ+ relationships. 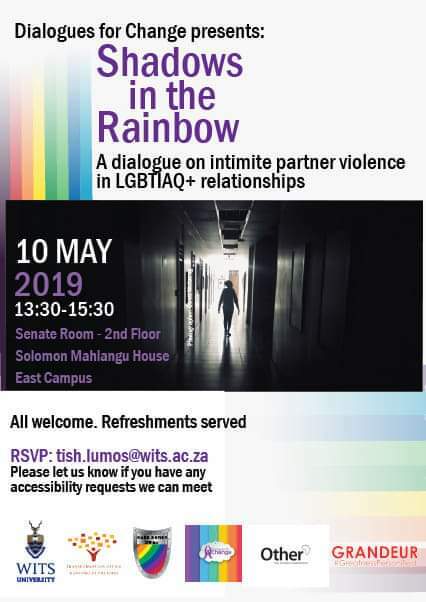 Shadows in the Rainbow will take place on May 10th, 2019 and it will be held at the Senate Room, Second Floor, Solomon Mahlangu House, East Campus of the Wits University in Johannesburg. "There has been a lot of violence and abuse in intimate LGBTIQ relationships have always been problematic and in the increase without intervention. And without intervention victims continue to suffer under the hands of their partners violating their rights, physically and emotionally abusing them. "This has cause many who have looked up to intimate relationships as spaces of safety to lose hope in their ability to love and be loved, with some cases resulting in depression and anxiety, which may lead to suicide," said Founder and Director of Dialogues for Change - Dumisani Macdonald Mkhondwane Dube. Dube said that they have professionals address and put to light the rights of victims. Including testimonies from survivors who have chosen to remain anonymous until the day of the May 10th. "The objective of this dialogue is to build awareness, comfort, confidence and competence by exploring their values and gaining knowledge to fight against such violence in an unbiased, non judgmental, knowledgeable and inclusive manner," concluded Dube. In making this event a success Dialogues for Change have partnered with Wits Transformation office and Granduer Magazine and supported by The Other Foundation.